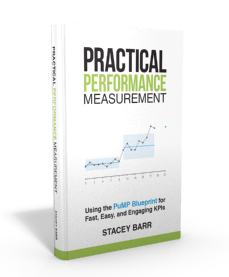 We can’t improve performance when we think KPIs are about success or failure, because it makes it a threat. Stoicism makes KPIs about curiosity and learning. We don’t need to be heroes for KPIs to work, riding in to save the day by hitting our targets, or catching out some bad performers who always fail to hit theirs. In fact, this heroism sets up a very binary success-or-failure mindset, constrained and held rigid by judgment. For measurement of performance to work, the mindset we need is curiosity, liberated and given direction by learning. 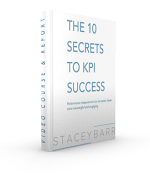 Does heroism play a role in your use of KPIs? Using KPIs with heroism means we think there’s a threat. 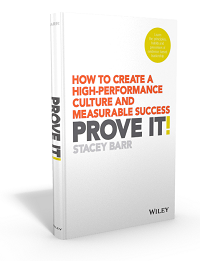 With the heroic success-or-failure mindset, people believe that KPIs will be used to deny their promotion, deny a pay increase, embarrass them in front of colleagues, reduce their budget, turn away their clients, or take time away from their “real work”. All of that is very threatening. And it results in gaming, often the only way to defend against these threats. The measure will be gamed, to focus on good performance. The data will be gamed, to only monitor good performance. The system will be gamed, to hit performance targets at the expense of everything else. Performance won’t improve because of this gaming. And likely the performance that matters will decline. Stoicism isn’t lack of caring, it’s lack of judgment. Wisdom, the logical and calm consideration of what our KPIs are collectively telling us about performance, as well as what they cannot tell us. This way, we get insight. Temperance, using KPIs with self-restraint to avoid quick-fixes and un-thought-through solutions, and with moderation to avoid trying to improve everything at once. This way, we get leverage. Justice, not using KPIs against people, but as tools that help everyone collaborate to improve the performance of the whole system. This way, we get buy-in. Courage, in using KPIs in the selection and testing of performance improvement experiments or innovations that will never be guaranteed to succeed. This way, we get learning. The stoic approach to performance measurement is more like the approach of a scientist than a superman. Using KPIs requires stoicism, not heroism. Use them in the context of learning, not threat. If we have colleagues or leaders who use KPIs with heroism, what can we do to invite them to use KPIs with stoicism? A very succinct and well thought out article. Probably one of the best descriptions of how KPI’s, used for the wrong reason can wreak havoc and the solution to this to overcome resistance to their use.